Publishing internet content, e.g. website, APP, etc, in mainland China is subject to national government rules and regulations which are enforced locally in China by city / region. These rules and regulations require your business, before publishing on the Chinese internet, to have access to an Internet content publishing (ICP) license. There are different levels of ICP license allowing you to publish different types of content and trade on-line. However, there are ways of publishing on the internet in China without your business needing its own ICP. These are Chinese platforms and services; Chinese e-Malls, Social media, search engines, etc. In these cases, the Chinese publishing rules and regulation must be adhered to. It is the responsibility of the platform / service provider to monitor, correct and close internet content as required. Under some conditions, i.e. Access to China, will help international businesses establish their internet content in China by acting as an agent for your Chinese publication. There are many ways of publishing your internet content in China. We recommend you consider all of them before selecting options. Note: “International” in the contexts of this paper means “any platform or service running outside mainland China”. This includes Hong Kong and Taiwan. A full management summary of these groups is on the next page. No ICP is needed for internet content published outside China. This includes Hong Kong and Taiwan. Access to your internet content outside China maybe blocked, (e.g. YouTube, Facebook, etc. ), or slowed down so making your internet content unusable (e.g. Google). We recommend you perform two activities, regardless of your trading intention. SDPs are a third partly supplier with the infrastructure for a business and / or consumer services, e.g. mobile telephone services, internet connection, search engines, e-Commerce sites (Amazon, eBay), etc. In mainland China, SDP’s are very popular. The service providers have the Chinese government approval to publish on the Chinese internet and therefore you do not need Internet Contents Provider (ICP) license to use providers services. The SDP supplier is responsible for making sure their customers follow the Chinese publication and trading rules and regulations. If you are selling from inside mainland China you will require a Chinese business to processes payments, tax return, etc. Most SDP have an International service which enable you to sell to mainland China without having a local Chinese business. Google is slowed down so it becomes unusable. Bing is usable in China. Most Chinese people use Chinese search engines. Recommendation: Needed for Chinese regions outside mainland China. Recommendation: Setup webmaster for each of the above search engines along with your SEO data in Chinese. International e-Mall purchases count for approx. 20% of the annual $600m e-Mall retail market. There are many local Chinese e-Malls. You will need a Chinese company / person to be able to sell in these e-Malls. Chinese people / companies often sell international products in the local Chinese e-Malls. Recommendation: The Chinese e-Malls are very good places to research your company and products and services. Alibaba (B2B platform) is the largest and most widely used business platform in China and internationally. This has been very successful for both Chinese and overseas companies marketing not just in China but throughout the world. In listing in Alibaba, you will be placing your product and services alongside Chinese and international businesses. Recommendation: Very good place to research the world market. In listing, you will open your company to a potential 60% of the world market. China has very strong media channels. These included; Tudou, YouKu, QIY. There must be over 100 media channels in China. They are tightly regulated. Overseas companies can upload their business media content on these services provided the Chinese regulations are followed. Except for LinkedIn, all international social media is blocked in China. With the on-going development of the Internet of Things Chinese rules & regulation are still to be developed for across border activity. China is quickly developing and rolling out the Internet of Things (millions of devices per months). Again, Chinese rules & regulation are still to be developed. Software as a service (SaaS) is software licensing. It is delivered on a subscription basis and centrally hosted and managed. It is sometimes referred to as "on-demand software” and was formerly referred to as "software plus services" by Microsoft. It is possible for an overseas company to offer SaaS to a business / consumer in mainland China provided the service is running outside China. If you have SaaS already, please check that your software components are accessible from China: https://webtest.accesstochina.com (including the help desk / support systems). Your SaaS is running on a local / international outside China. Your SaaS is hosted locally in China accessed by Chinese offices over a local VPN. Note: International VPNs are not allowed in China. Your SaaS is running in China White labelled to a Chinese business. The ICP will be the responsibility of the Chinese company. This way the software can remain under control. Local Chinese hosting, ICP certification and a Chinese business will be required. Locally hosted software. Local Chinese hosting, ICP certification and a Chinese business will be required. Recommendation: “Frontend” of your software hosted in China and your backend software hosted away from China. This will go a long way to protect your IPR. Publishing your own internet contents on the internet international or within China using hosting service, server, etc. Locally or international hosted service outside China. Recommendation: Please run through the Check List and test your services from inside China. Before you can publish your internet content in mainland China you will require an ICP certificate. To achieve this, you will need to create a Chinese business. Recommendation: More information on ICP and publishing on the internet in China is contained in the detail of this paper. 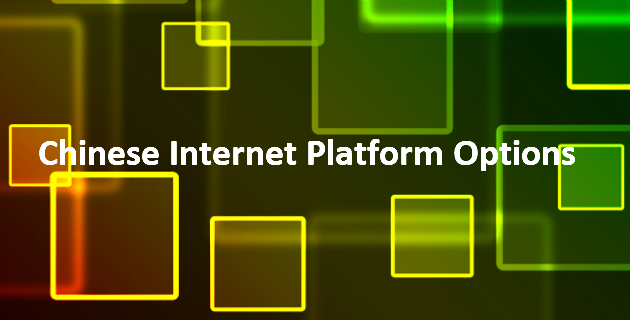 A platform is where you load your internet content to an existing service. The two main global search engines are not used in mainland China. Google access has slowed down so it takes over 60 seconds to open the home page. Bing, Microsoft search engines, while available in China, have less than 2% usage. Yahoo, again owned by Microsoft, is not used in mainland China. These search engines are used wildly around Asia. We recommend that you have Chinese SEO for these markets. For more information please see Chinese search engine. Historically, Google is accessed from China using VPNs. International VPNs are now being closed in China and therefore it is expected the Google traffic will be lower as 2018 progresses. Most Chinese search engines support the main functionality you can find in Google. If you using a Chinese search engine for advertising, you will need to supply a lot of information including company and product certification / registration details. It is the responsibility of the search engine to validate all companies before they accept advertisements. Your business does not require ICP certification to use this type of internet platform. We strongly recommend that you set up SEO for these search engines otherwise you will only be listed in your internet contents language not Cantonese or Mandarin. Note: Shenma only started in 2017. It’s taken up has been formidable. Shenma brings together e-Mall contents into a single search engine; “all the products” in one place. China on-line retail market is estimated to be worth $500bn in 2018. Of which 15% to 20% comes from purchases of international goods on-line. A market worth up to $100bn in 2018. Most of China (90%+) on-line retail sells comes from the e-Malls; on-line department store, e.g. Amazon, Tmall, JDBuy. International goods are available in all these types of platforms. The international e-Malls can be seen in China with acceptable response times. Amazon has the biggest share of the international e-Malls in China. eBay is often used by Chinese companies to sell internationally. eBay is not used in Chinese for international purchases in any volume. There is a local Chinese version of Amazon; China Amazon. For international and local business China Amazon has a very low percentage of the market. The general issues with overseas e-Commerce sites are the shipping to China. This includes, posting, tracing, returns, customer clearance, etc. Many products in international retail e-Malls are not setup for the Chinese market, e.g. postage. A starting point could be to setup your products in Amazon for shipment to China? There are Chinese shipping agents that will handle the end to end postage and delivery. It is only a matter of time before the postage costs and processes for shipping to China are as cost-effective sending goods from China. Apart from Amazon, all these retail e-Mall platforms are Chinese owned. To enable international companies to trade inside mainland China these platforms operate in Hong Kong. Hong Kong trading is based on: one country two systems. As far as mainland China is concerned, trading with Hong Kong an international country. Therefore, international businesses can list their product on the internet in Hong Kong without needing a China business to trade or ICP license. E.g. Tmall Global. The retail e-Mall platforms then list the international products in search results inside their China e-Mal platforms under the sub heading “trading without borders”. This way of marketing and trading in China has been very successful. Please visit “being seen in China” for more information. There are many the Chinese local retail e-Mall platform. They have been very successful. Today Chinese on-line retail market has overtaken USA in size and is now the biggest in the world. Please Note: Missing from the above statistics is WeChat. WeChat is a Platform which enables many internet activities including on-line shops. It has been very success. To market and sell in the Chinese local retail e-Malls you will require a Chinese company or a Chinese agent selling your products on your behalf. In addition, your will have to meet many appropriate local Chinese testing standards, e.g. electrical product “ccc” certificate. These platforms are a good place to research your products and your competitors. You may find your products are already being sold or there is a copy. It is very important to register your brand in China. This Chinese business platform was the first major presence on the Chinese internet. This platform, like other Chinese business platforms, enables companies to market their product and services within mainland China and world-wide. If you are using a Chinese business platform, where you paying for services, you will need to supply information including company and product certification / registration details. As these are not e-commerce platforms you do not need a Chinese business and as it is a platform your company does not need an ICP license. All the international social media platforms are blocked in mainland China. If you are using international social media content inside your website you will find that it will not be shown. Using international social media content inside China is not an option. Please see website.accesstochina.com to learn more. There are over a 100 social media channels in mainland China. It is very popular and an effective way to communicate with the Chinese consumer. Some of these platforms allow businesses and members of the public to load video content e.g. YouKu. Most of these video platforms are looking for media content. For some of these social media platforms you will need to be a Chinese business to open an account. There are China agents that can help you load social media content to these platforms. In doing so they will be taking responsibility for the content in mainland China. Again; the monitoring of the content is the responsibility of the owner of the social media platform. No Internet Chinese publishing certification is needed to use social media platforms. Most international social media are blocked. The exception to this in the past has been LinkedIn. We now seeing LinkedIn blocked on some of the Chinese internet network. Before changes this year, many Chinese people accessed the Chinese internet over VPNs. Many of Chinese VPNs have been closed and therefore the use of the international social media from China will be reduced. If your website contains content from International social media, e.g. Instagram, the images will be blank on the website. There are many social media platforms in China. The most popular platforms are owned / trading partnerships with Tencent or Alibaba. The most popular social media platform today (June 2018) is WeChat. This could be changing given the growth in Shenma as a search engine which is a partnership with Alibaba. Alibaba social media platform is Weibo. Overseas people can join these platforms from outside mainland China. Company membership of the social media platforms often requires a Chinese business. The rules for using Chinese social media often changes as they try to go global with the products and services on the platform. The monitoring of the content of the platform is the responsibility owner of the media platform. No Internet ICP licences are needed to use these internet platforms. The International internet of things to operate in China needs local infrastructure to collect the data. A company to do this will need an ICP licensee and a Chinese business. We would recommend that you work with businesses in China already developing and / or using the internet of things. The more interesting opportunity is where an international company is developing products and services that use the internet of things. Large companies in China. e.g. China Telecom, are looking for opportunities to further develop the use of the Chinese Internet of Things. The Chinese internet of things is developing very quickly in China. This example is where China Telecom and Huawei are working in partnership to developed the services. The internet of things needs internet backend local connection, i.e. sim cards. To create these networks, you need telecom ICP license. This type of license is not available to international businesses. International business looking to enter this market should look for a business partner in China. Supplying international services to the Chinese market will not require an ICP license as the service is being run outside China and any trading agreement will also be outside China. The service fees can be paid from China on Chinese an international credit card. As long as your credit card processing company can process UniPAY credit cards. A formal agreement with payment terms, etc, will be required for larger amounts of money that require a bank transfer from China. The Chinese business will have to register the agreement at the bank to make payments. There are two major inhibitors that will stop the development of international Chinese business. Not finding your business on the internet from China. More information sees here. Cannot access your internet presence from China … More information sees here. An enclosed network is where the Chinese company access your services over an enclosed network within mainland China. In this scenario the public cannot see the service and therefore an ICP license is not required. We recommend that you run service from a Chinese data centre to give good local response time and performance. White label is where you are running a service on behalf on another business. In this case a Chinese business. In the example the white labelled service brand name is owned by the Chinese business. You will require an ICP licence and it is the responsibility of the Chinese company to obtain this. In the case of on-line trading inside mainland China you will need to add Chinese payment gateways to your system. Please ensure that the Chinese company arranges for the Chinese payment gateways for testing and trading. Please visit “being seen in China” for more information. This is the same as white label with the major difference being that you are responsible for the ICP license, Chinese trading company. We recommend you only through the cost of creative Chinese service if you have customers ready to use service as soon as it is implemented. In this example, it can apply to any of the above SaaS’s. We do recommend splitting front line services from backend services. In doing this you can move the backend services outside China. You may be able to keep your USP coding directly under your control on your existing platform. Frontend website and local data for the collection of user data. The solution will be a balance between local response times and overall uses appearance vs protection USP of your software and service. Your service / internet content is running on the international internet before you look at trading in China. You want to set up your own services in China. You will need a Chinese business and ICP license. We recommend continue through the Chinese internet Check List as the starting point. If it the first time you have created your own business in China we recommend bring in a mentor who has done this before, e.g. trade organisation; CBBC. Software companies supplying Chinese businesses need to make sure the Chinese company applies for an ICP license. Our recommendation is that ICP application is part of any agreement between the businesses. Our other recommendation to overseas software companies selling into the Chinese market is to register their software with the Chinese authorities. This is like “brand registration” for software. It will protect your software from direct copying but not from reverse engineering. If the option exists, we recommend only implementing your frontend software in China. Leave the backend processing at your current location. This option is only available for systems where there are only small amounts of data to be transferred or the customer is prepared to wait as data moves around the world.